Just as Dallas artists organize to address displacement, a prominent painter whose shows have been visited by anti-gentrification protestors comes to the DMA Sunday. Though their cartoon expressions look depressed, Giovanni Valderas’ piñata houses are not alone. Last spotted calling attention to housing inequality at Saturday’s St. Patrick’s Day parade in Dallas, his guerilla-esque Casita Triste project strutted down Greenville Avenue alongside representatives from Texas Tenants’ Union. And Valderas’ mascots will welcome the company of other projects locally, too, while the Dallas City Council picks apart the new housing policy rolled out Monday by Raquel Favela, the city’s chief of economic development. 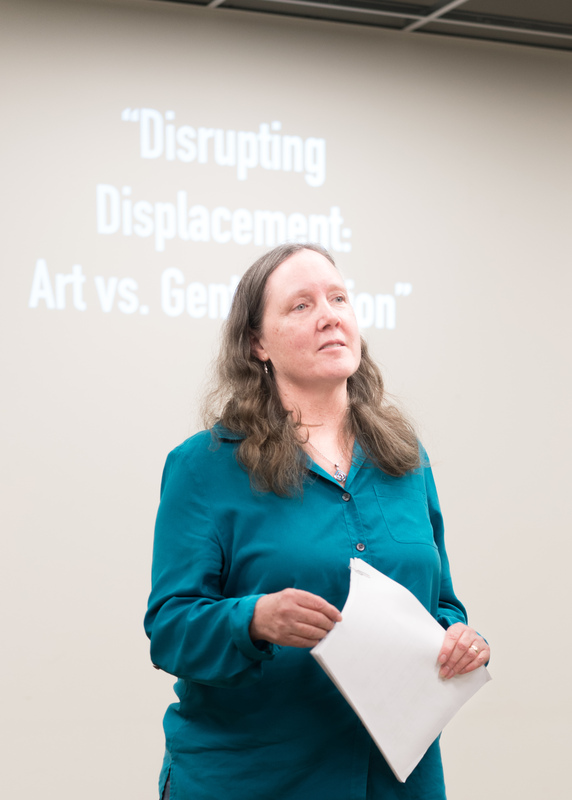 Earlier this month Valderas was in the seats among artists, social workers and longtime residents who gathered for Disrupting Displacement: Art vs. Gentrification. It was the discussion part of an experiment by Dallas artists/educators Vicki Meek and Edyka Chilomé, commissioned by Alternate Roots, the only arts organization that provides monetary support specifically for artists in the South whose work intersects with social and economic justice. The project began when both artists contributed articles on a theme: Creative Placemaking. Meek took a critical stance with her writings, whose publication is forthcoming. “I chose to explore how this latest initiative might be called ‘Creative Placetaking’ since in many cases the introduction of arts projects into low-income communities has signaled the first step towards gentrification and displacement,” Meek wrote to me, as an expansion of her treatise came together in December. Her chief concern: How could artists be constructive by directly supporting communities most negatively affected? Meek and Chilomé used a grant from Alternate Roots to bring artist and documentary filmmaker Betty Yu to Dallas to talk about the work she’s done directly with tenants in New York’s Chinatown. The hook, during a time when an aesthetic of cultural preservation is sometimes deceptive in the worlds of art and “urbanism:” CAB itself was formed at the request of the Chinatown Tenants Union. It’s a model Meek and Chilomé were interested in exploring here. They invited Sandy Rollins, executive director of the Texas Tenants’ Union — the person Valderas says inspired him to act. The summons was held just one day after Housing and Urban Development Secretary Ben Carson snipped the terms “inclusive communities” and “free from discrimination” from HUD’s mission statement. Yu and Chinatown Art Brigade (CAB) have literally thrown a spotlight on what’s lost when developers encourage galleries to come to a neighborhood and the rent spikes, projecting messages of neighborhood pride and defense from tenants in Chinese, Spanish, and English onto the facades of relevant buildings at night. Communal sidewalk chalk sessions at storefronts and neighborhood walk-throughs give tenants an outlet. The premiere subjects of Yu’s work and her target audience are people who’ve been displaced by gentrification or who are at risk of displacement, she said. Members of CAB joined other activists to bring their message — which holds artists accountable for their part in rapid gentrification and cultural erasure within neighborhoods where the residents are largely people of color — to the VIP opening of artist Laura Owens’ exhibition at the Whitney last year. Owens, a painter, and her dealer Gavin Brown were behind the flood of galleries that pushed into Los Angeles’ Boyle Heights neighborhood and then expanded into Chinatown and Harlem. Sunday Owens’ self-titled, large-scale retrospective opens to the public at the Dallas Museum of Art. (The press preview is Thursday.) Some of the activists who showed for the demonstration at the Whitney traveled from LA to speak out. Owens’ paintings, whose playful and formally referential content many consider apolitical, couldn’t be coming to Dallas at a more interesting time. Yu’s appearance in the city was significant in context with other panels happening on the subject of art and gentrification this month. I wrote about the first one, which took place at the Oak Cliff bookstore Wild Detectives. Disrupting Displacement was held at a CitySquare complex south of downtown that helps provide basic services to homeless and low-income residents. Rollins’ words that night were impassioned. “I think I’m going to skip my power point, and just speak,” she said. Rollins, one of two people employed by the Texas Tenants’ Union, was missing another meeting to appear at the summons: a free weekly workshop hosted by the organization each Wednesday night since 1973. She went on to cite the broader, oft-reported stats: almost half of tenants in Dallas pay 30 percent of their income or more for rent; in the DFW area there are 19 low-income housing units for every 100 poor families. It’s been established that “opportunity has been racialized in Dallas.” Those words belong to Mike Koprowski, then the executive director of Opportunity Dallas, who gave a presentation to the city’s human and social needs committee in November. His numbers and maps made it plain, as it has been. Housing inequality was the root of poverty in Dallas, and housing inequality is itself resegregation. Rollins testified to this, and acknowledged the development of a housing policy but remained skeptical because of her experience with the city. “We had a poverty task force and there was no recommendation to raise the minimum wage,” she said. In closing, Rollins issued a call-out to artists who’d like to partner with Texas Tenants’ Union. Meek and Chilomé were ready with support. They invited artists to apply for a $1,000 grant via Alternate Roots’ Our Town Learning Engagement Project, to be given to a collective led by an artist of color — or perhaps two individual artists of color, at $500 each — who attended the talk. The objective is to develop a “creative direct action that disrupts displacement.” Recipients will be announced April 20.